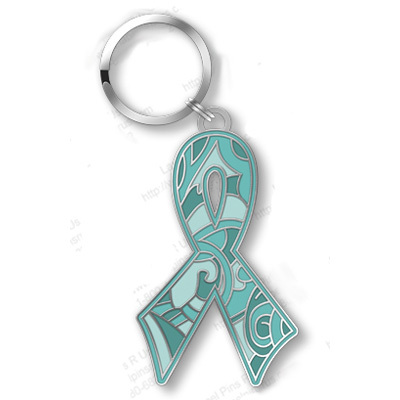 Teal Paisley Ribbon Key Chain A great way to show your awareness and support for Ovarian and Cervical Cancer Awareness every day. Also makes a great Zipper Pull for your jacket, backpack, suitcase or gym bag! The key chain is Cloisonne and exclusive to the Pink Wings Teal Ribbon Shop. Key Chain is 2" tall. Bulk pricing available.